The driving motivation behind particle physics experiments is the desire to uncover the true nature of fundamental forces and particles. Our current standard model is believed to be an effective theory, which has a deeper underlying theory reachable in the next generation of experiments. In the electroweak sector, where great successes of the past decades have predicted and verified the unification of the electromagnetic and weak nuclear forces, precision measurements at the CERN large electron positron collider (LEP) and the Fermilab proton-antiproton collider (Tevatron) demanded that there be either a light Higgs particle with a mass less than about 200 GeV or a physical system mimicking its interactions. The monumental discovery of the Higgs boson by the ATLAS and CMS experiments at the LHC marked the beginning of a new era. The Higgs boson may be regarded as, on the one hand, the corner stone of the highly successful Standard Model and, on the other hand, as the portal giving access to new physics. It is imperative to study the new particle in precise detail. At the same time, the question on the stability of the Higgs boson and the observation of cold dark matter in the universe, compellingly point to new physics at the Terascale. In the flavour sector, a decade of increasingly precise measurements of the properties of heavy quarks has shown remarkable agreement with the standard model predictions, and we are now moving into an era of precise investigations of the neutrino sector. The demonstration by the Japanese Super-Kamiokande and Canadian SNO experiments that neutrinos flavours oscillate but that their masses are likely much smaller than those of the other elementary particles suggests that there are critical phenomena in particle physics which cannot be explained by the standard model. This physics likely had a very significant role in cosmology. There are some hints that this new physics might be accessible to upcoming experiments. In the strong sector, the theory of quantum chromodynamics (QCD) has been successfully used to predict the behaviour of quarks and gluons at high energies observed at the HERA collider at DESY Hamburg as well as LEP and the Tevatron, but the lower energy regime, where they are bound into particles such as protons and neutrons, remains theoretically and experimentally challenging and requires further investigation. More than a hundred Canadian researchers from across the country, including the TRIUMF ATLAS group, are involved in the international ATLAS project based at CERN; the team is called ATLAS Canada. TRIUMF also supports the international ATLAS Canadian Tier-1 Data Centre. The ATLAS experiment is one of the two general-purpose detectors at the LHC at CERN, the European Laboratory for Particle Physics. The LHC was designed to accelerate intense beams consisting of thousands of bunches, each containing up to 1011 protons, to an energy of up to 7 TeV. The protons collide in the heart of the detectors, allowing their constituent partons to annihilate for the creation of new particles. Bunches collide 40 million times every second, giving a luminosity of 1034 cm-2s-1. This unprecedented combination of centre-of-mass energy and luminosity allowed the LHC and the ATLAS and CMS experiments the historic 2012 discovery of the Higgs boson that led to the 2013 Nobel Prize in Physics to be awarded to Francois Englert and Peter Higgs. However, ATLAS is also designed to explore beyond-SM physics, including searches for dark matter and supersymmetric particles. To this end, the ATLAS collaboration is in the midst of a decade-long series of staged upgrades to ATLAS to prepare it for the High Luminosity LHC era, when the collider will provide multiple times the design beam intensity opening the way to potentially access the postulated beyond-SM physics. T2K is a long baseline neutrino experiment that studies flavour oscillations of neutrinos produced in a man-made beam. Neutrino oscillations are the first evidence for new physics beyond the standard model. T2K uses the Japan Proton Accelerator Research Complex (J-PARC) proton synchrotron, located in Tokai, Japan, to produce an intense beam of muon neutrinos or muon antineutrinos that is directed towards the Super-Kamiokande neutrino detector in western Japan, where some of the neutrinos are detected. Operating since 2009, T2K made the first observation of muon neutrinos changing flavor to electron neutrinos in 2013, a discovery for which T2K shared the 2016 Breakthrough Prize in Fundamental Physics. T2K currently operates with both neutrino and antineutrino beams searching for an asymmetry in their oscillation rates, an effect known as CP violation. TRIUMF and the T2K Canada team have played a major role in the T2K experiment, building and operating a proton beam monitor and near detectors, and developing new tools and methods for the analysis of T2K data. To increase the sensitivity for neutrino detection by more than an order of magnitude compared to T2K, a new experimental collaboration has been formed to build the Hyper-Kamiokande experiment. 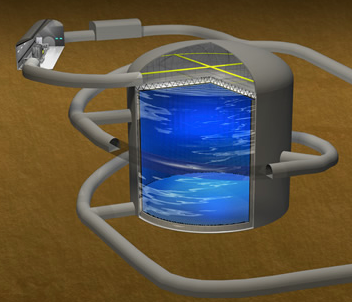 Hyper-Kamiokande will use similar detector technology as Super-Kamiokande, with an 8 times larger detector mass to increase the rate of detected neutrinos. The J-PARC beam intensity will also be increased by a factor of 2.5 to achieve a 20 times larger rate of neutrino and antineutrino detection in Hyper-Kamiokande. Hyper-Kamiokande will have world leading sensitivity to search for CP violation and make precision measurements of neutrino oscillations, to detect neutrinos from supernovae and to search for the decays of protons, another signature of new physics beyond the Standard Model. Hyper-Kamiokande will also probe the oscillations of solar neutrinos and search for dark matter as part of a broad physics program. The University of Tokyo, the host institute for Hyper-Kamiokande, has announced that the construction of the experiment will start in 2020. TRIUMF and the Hyper-K Canada group are developing contributions to Hyper-Kamiokande to maximize the physics output of the experiment by reducing sources of systematic bias in the Hyper-Kamiokande measurements. The Hyper-K Intermediate Water Cherenkov Detector (IWCD) uses the NuPRISM concept to measure neutrino interactions from a range of neutrino energies in order to precisely understand how neutrinos interact with nuclei in neutrino detectors. TRIUMF is leading the development of high resolution multi-photomultiplier tube (multi-PMT) modules that integrate fast photosensors and readout electronics in pressure tolerant vessels that can be deployed in the IWCD and Hyper-Kamiokande detectors. The EMPHATIC experiment measures the particle production processes that lead to the production of neutrinos in neutrino beams so that the beam composition can be accurately calculated. TRIUMF is developing an Aerogel Ring Imaging Cherenkov (ARICH) detector that will be used to identify particle types in the EMPHATIC experiment. SNOLAB’s ultra-low background places it centre stage in two quests: on the cosmic scale for interstellar dark matter and on the microscopic scale for neutrinoless double-beta decay. Astrophysical measurements indicate that 80% of the matter in the universe is “missing,” that is, we can see its gravitational effects but it does not emit any heat or light. This “dark matter” is hypothesized to be the stuff that shapes the destiny of the universe, and yet we have no idea what it really is. Experiments at SNOLAB will search for hypothesized rare interactions between dark matter and normal matter. On the microscopic end of the spectrum, neutrinoless double beta decay probes the very nature of antimatter. Advanced theories of particle physics and the Big Bang suggest that the neutrino particle may have a special nature: it might be its own antiparticle. Answering this question about the neutrino could reveal new insights into why the modern universe is predominantly occupied by matter (including dark matter!) rather than anti-matter. The initial program of SNOLAB will likely include experiments that focus on direct detection of dark matter (DEAP/CLEAN, PICASSO, Super-CDMS) and neutrinoless double-beta decay (SNO+, EXO). The standard model is the best theory that physicists currently have to describe the actions and interactions of fundamental particles, the building blocks of the universe. The standard model (SM) agrees with most of what has been observed, but is widely believed to be only an approximation of a more basic and fundamental model whose properties are not yet known. The SM leaves open many questions. For example, the SM predicts only a subset of the possible particle interactions allowed by a more general theory that satisfies all aspects of a symmetry known as Lorentz invariance. Other interactions have been omitted based on empirical observations, but are they really completely absent? Experimental tests of the SM either place limits on the strength of these interactions or more optimistically find them and show the SM to be incomplete, requiring physics beyond the standard model. The strong force is one of the four basic forces of nature, along with gravity, electromagnetism, and the less-familiar weak force. Inside the nucleus of the atom, the strong force binds the smallest particles of matter, quarks, together into protons and neutrons. In addition to protons and neutrons, it also binds together other, simpler particles, such as pions. Like protons and neutrons, pions are built of quarks - two quarks (one quark and one anti-quark), to be exact. The quarks are bound together by the strong force. The field generated by the presence of the strong force also gives rise to additional, short-lived particles inside the pion: a bevy of quarks and gluons that constantly blink into and out of existence. This group of extra particles generated by the strong force is called the quark-gluon sea. By measuring the quark-gluon sea, scientists can study the strong force at its most basic level. While a very good theoretical framework (called quantum chromodynamics, or QCD) is able to accurately describe how quarks and gluons interact at extremely high energies (or, equivalently, when the quarks are very close together), it has been very difficult to apply QCD to lower energy (larger distance) phenomena. The paradox is that the increasing complexity of the quark-gluon interaction as they get further apart is critically important to their observed confinement within nucleons and mesons (the nuclear building-blocks), but we cannot perform the QCD calculations necessary to confirm our understanding. This is because in the “confinement regime” the quark-gluon coupling strength is too large to allow perturbative theoretic methods to be reliably used. One of the central problems of modern physics remains the connection of the observed properties of the nuclear building blocks (protons, neutrons, mesons) to the underlying theoretical framework provided by QCD.